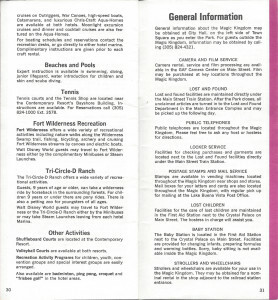 Multiple sources describe a newspaper-format guide and map that was available starting with the park opening in 1971. 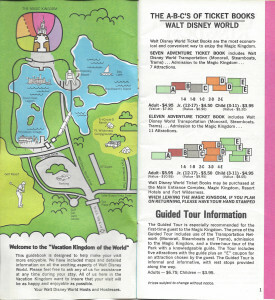 This guidemap for 1972 represents the first available pamphlet-sized park guide. 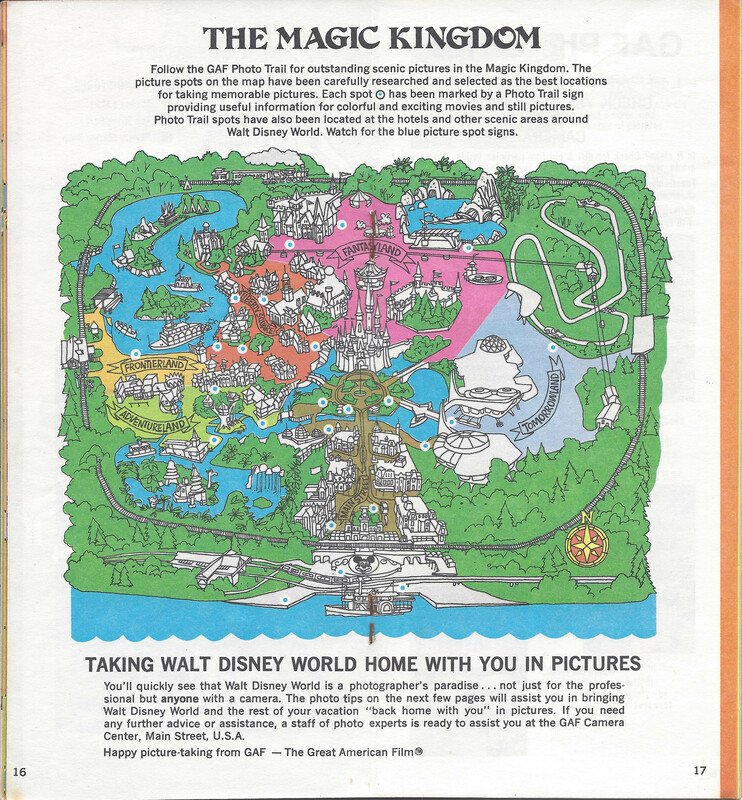 The cover shows Cinderella Castle, surrounded by a lot of really young looking landscaping. 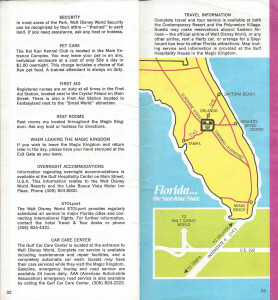 There’s also the great vintage style Walt Disney World logo. Looking closer at the castle, the photo is from an angle that is a little hard to place. 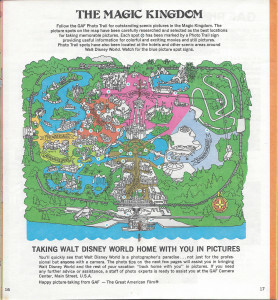 A little sleuthing uncovers that it’s actually taken from the southwest of the castle, somewhere near Adventureland. The wooden bridge in front of the castle crosses into Liberty Square. It’s confusing because the picture is flipped horizontally. Looking closely at the lower row of towers, you can see the arrangement is the west side, not the east like you would expect from first glance. Last, there is the GAF sponsorship at the bottom, a company with an interesting story of its own. 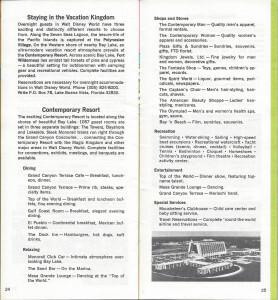 Upon opening the guide, you find an introduction to all that 1972-era WDW had to offer: 1 theme park, 3 hotels, a campground, and some assorted other activities. 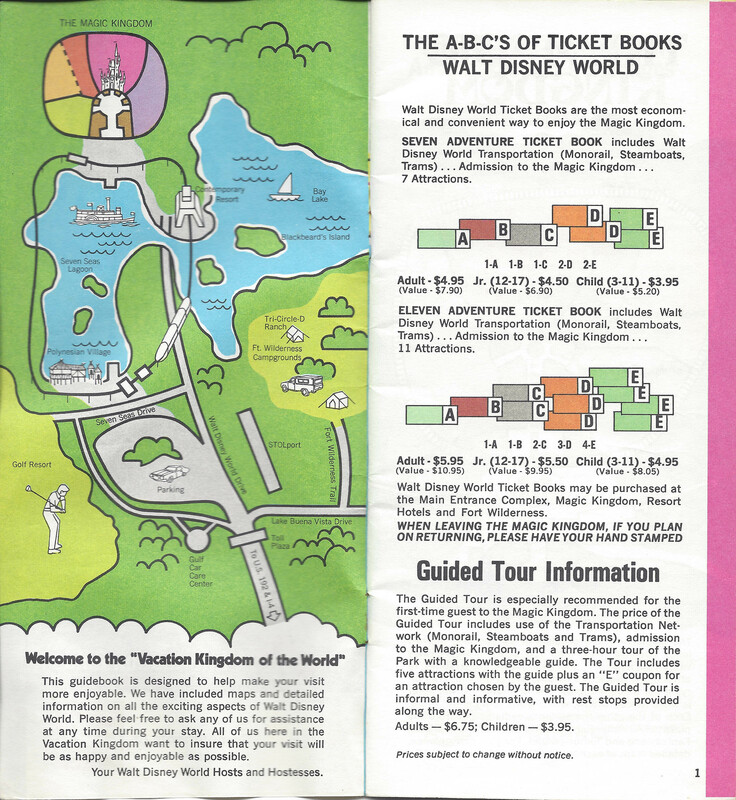 There’s also a primer regarding the classic A to E tickets. It’s pretty amazing to see the entertainment that $5.95 (a $10.95 value!) could get you then. Also, don’t forget to get your hand stamped! 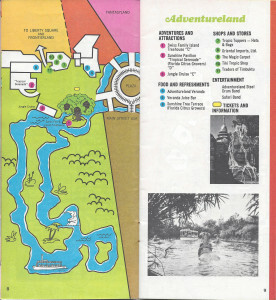 The next page gives you an overview of the park itself with orientation to all the lands. You can also see what your little A ticket will get…not much. 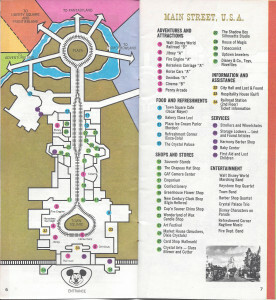 There are 4 different transportation options that run on Main Street, or Cinderella’s Golden Carrosel. 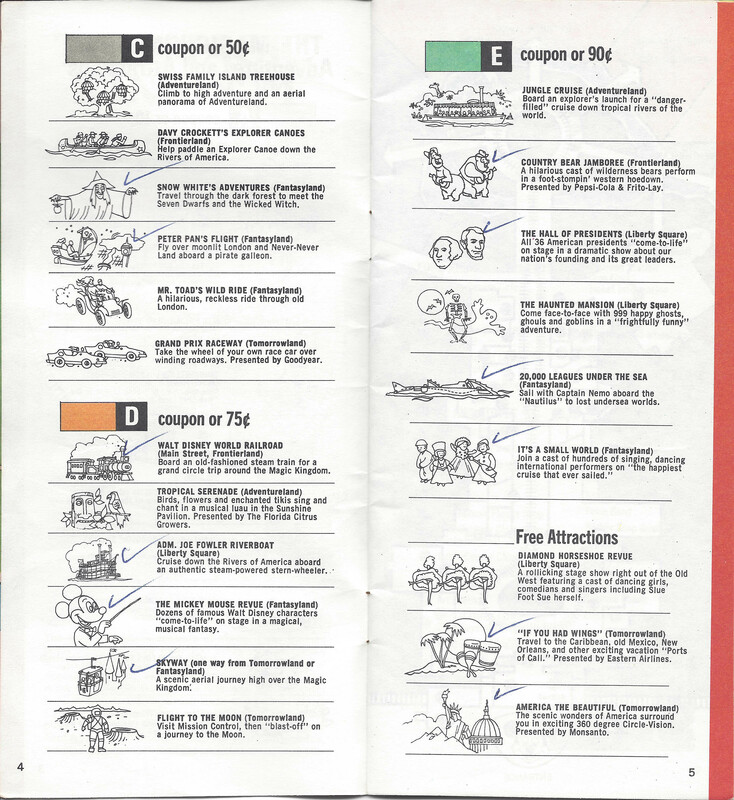 There’s probably a reason that most vintage ticket books for sale have all the A tickets still attached. 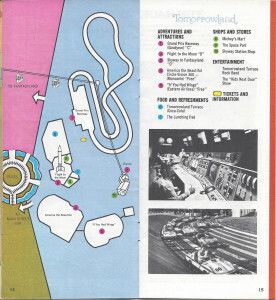 The B tickets get you a little more, including present-day favorites like Dumbo and the Mad Tea Party. 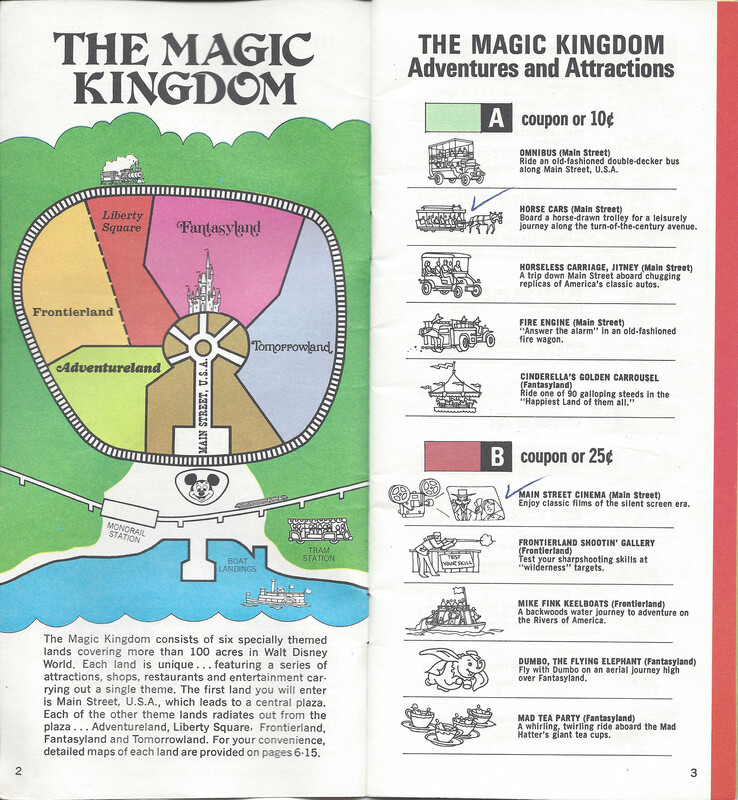 Moving up to the C tickets grants you access to some of the classic dark rides in Fantasyland, including Snow White’s Adventures, Peter Pan’s Flight, and Mr. Toad’s Wild Ride. 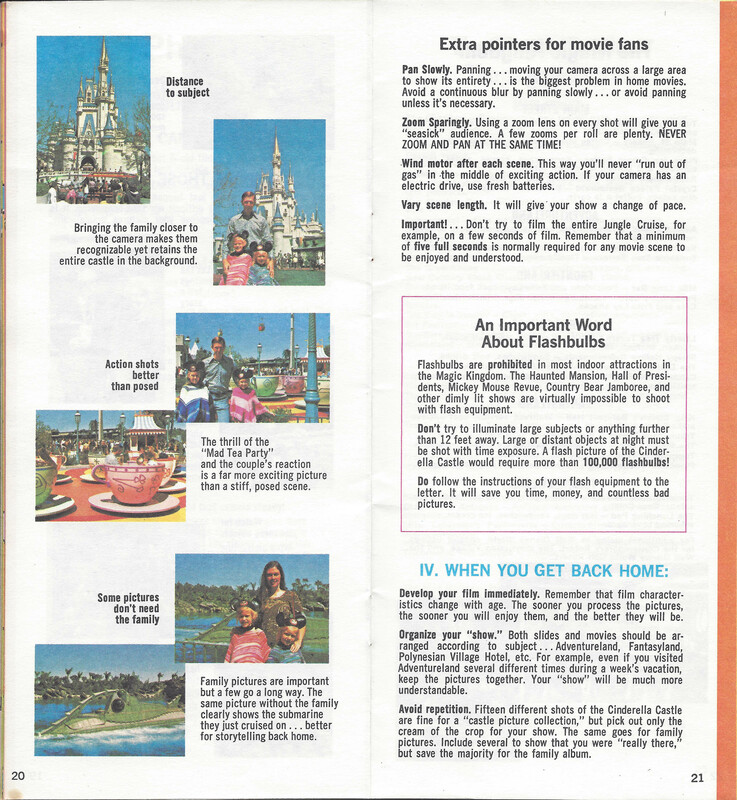 You also could use it on the long-gone Davy Crockett Explorer Canoes or the Swiss Family Treehouse for some more free-form fun. Last but not least are the Grand Prix Raceway cars, where the driving excitement is amplified by the exhaust-induced buzz! D ticket adventures like the Railroad, Tropical Serenade (AKA Enchanted Tiki Room) and the Mickey Mouse Revue all represent some of the unique entertainment that you would not find at your average amusement park. 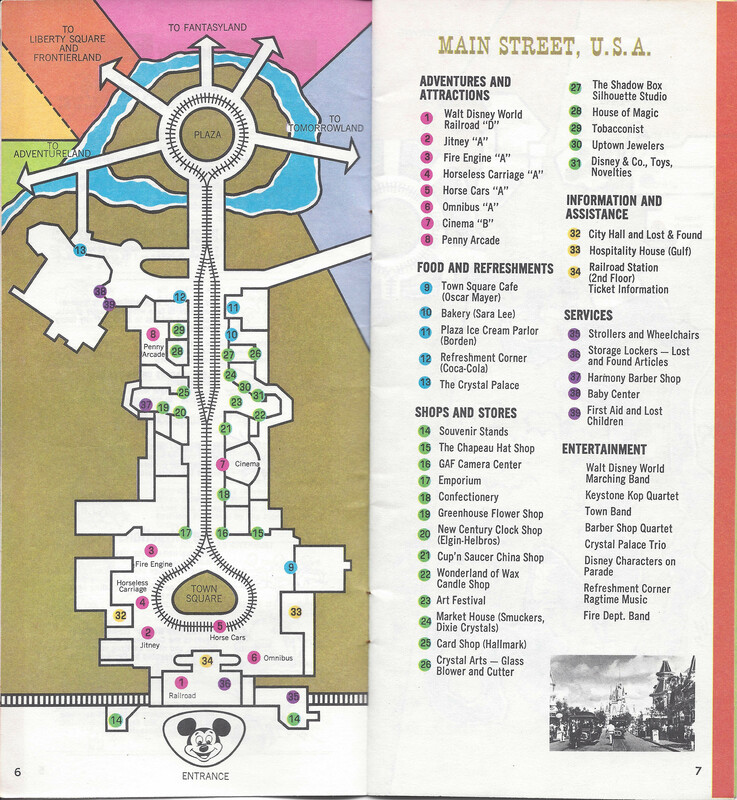 A closer look at Main Street USA reveals a dramatically different land than the present. 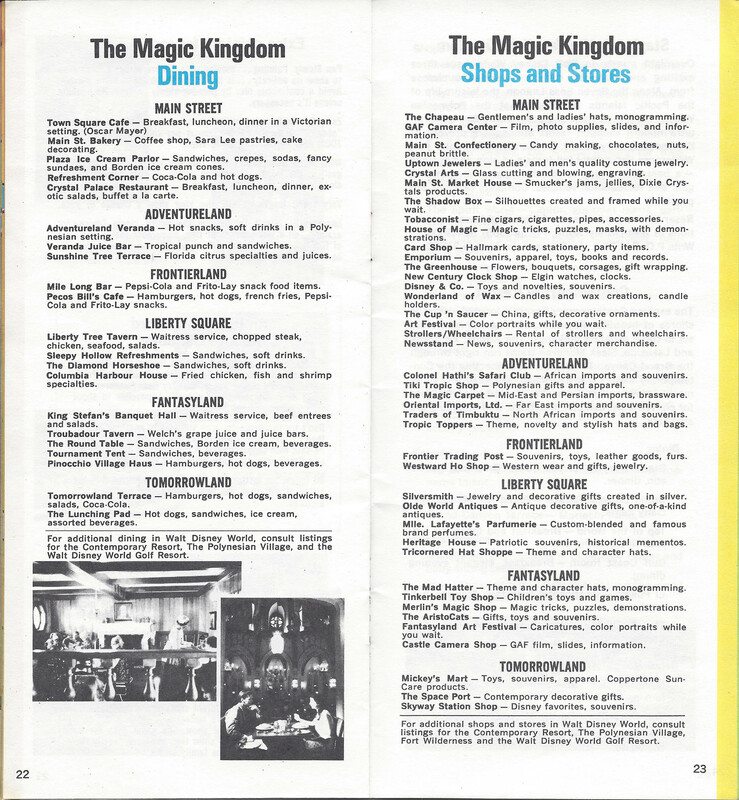 People that have never been to the Magic Kingdom until recently might not realize that it hasn’t always been a continuous Disney Store on both sides of the street. While the individual shops certainly had more character, I honestly can’t see myself shopping for candles or china (!) while vacationing at a theme park, and I’m guessing that I’m not the only one that thought along those lines. 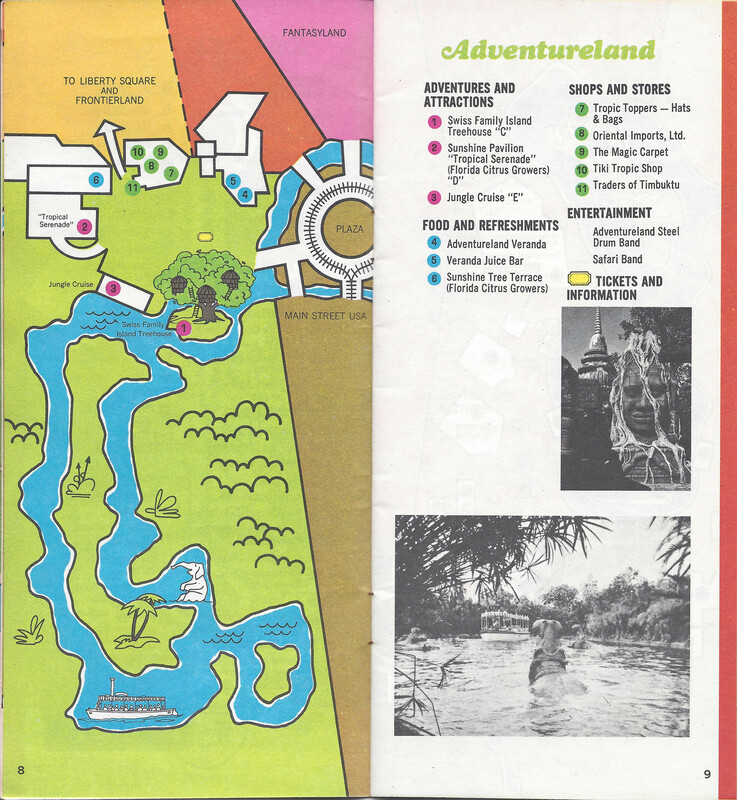 Next stop, Adventureland! 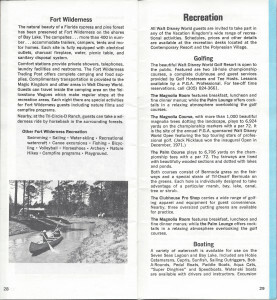 Home of a handful of adventures, at least in 1972. 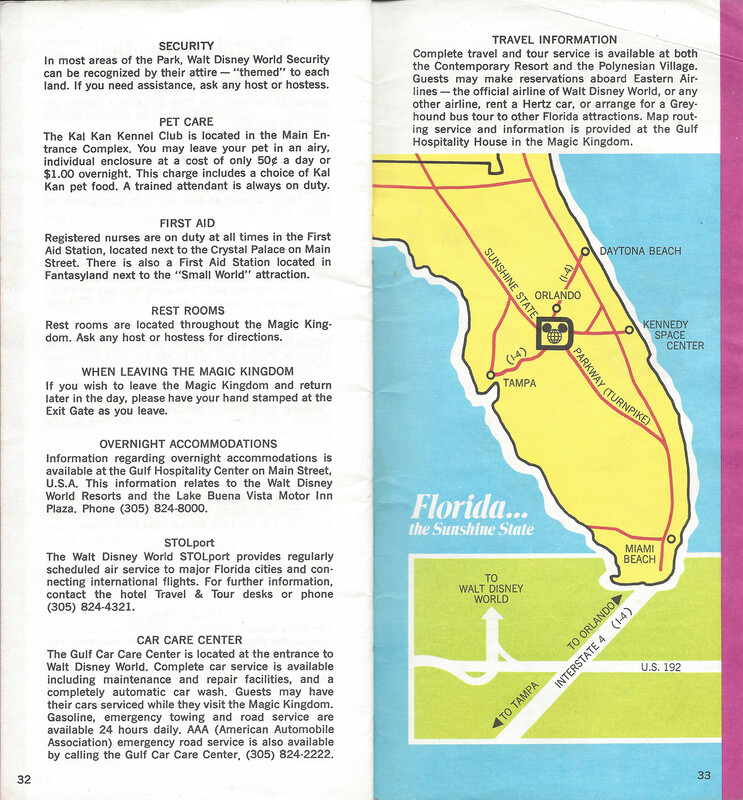 The area was significantly smaller in that time, ending at the Sunshine Pavilion rather than continuing on to the area that now includes Pirates of the Caribbean. 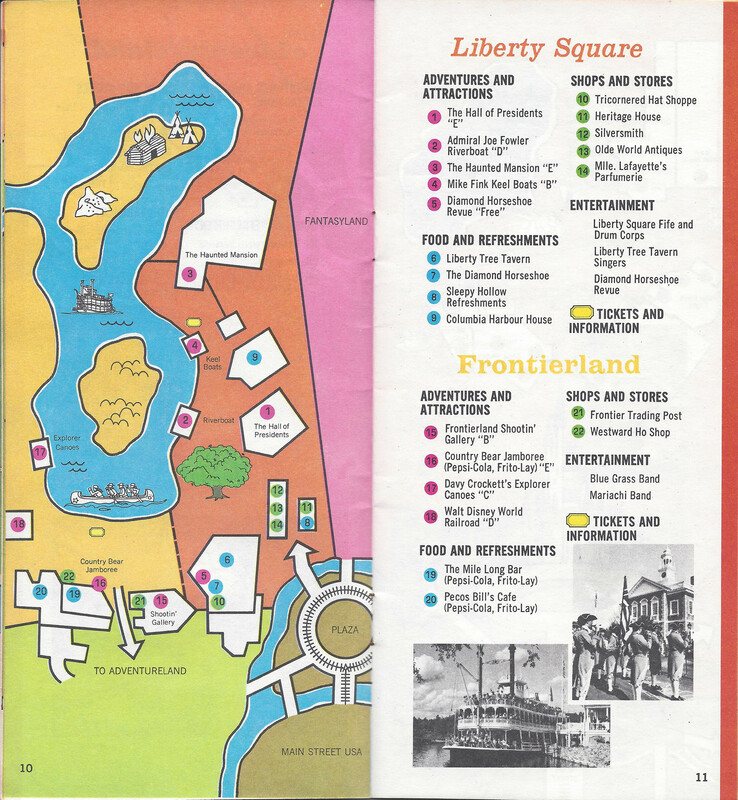 The “shortcut” to Frontierland by Sunshine Tree Terrace used to be the ONLY way to make your way north. 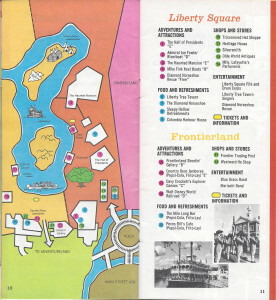 The combination of Frontierland and Liberty Square was one of the more exciting parts of the park, attraction wise. 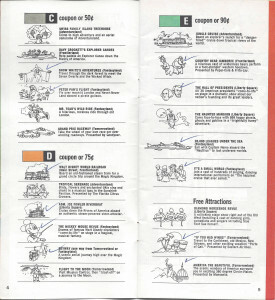 No less than 9 different attractions were present, most of them C, D, or E ticket attractions. 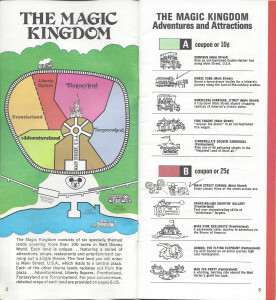 Coming into Fantasyland would definitely give you the feeling that the Imagineers had concentrated a lot of effort here. 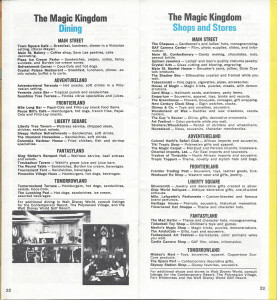 Ten different attractions were to be found, including the classic dark rides mentioned earlier. It’s A Small World is here, of course. 20,000 Leagues Under the Sea was also here, one of my favorite extinct attractions. I can still remember the Nautilus replicas moving through the lagoon, looking both sinister and cool. If you didn’t want to make the walk to Tomorrowland, you could catch the Skyway here instead, boarding adjacent to Small World. 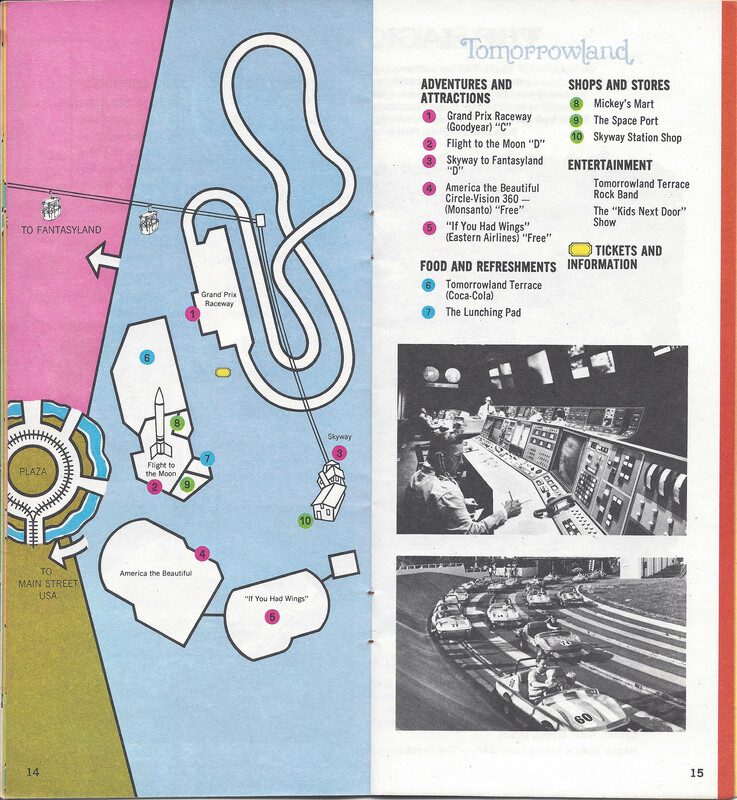 The title of Tomorrowland was more accurate than probably intended, as in “tomorrow there will be more here.” You could choose from the Skyway back to Fantasyland, the Grand Prix, Flight to the Moon, or two free attractions (American the Beautiful or If You Had Wings). 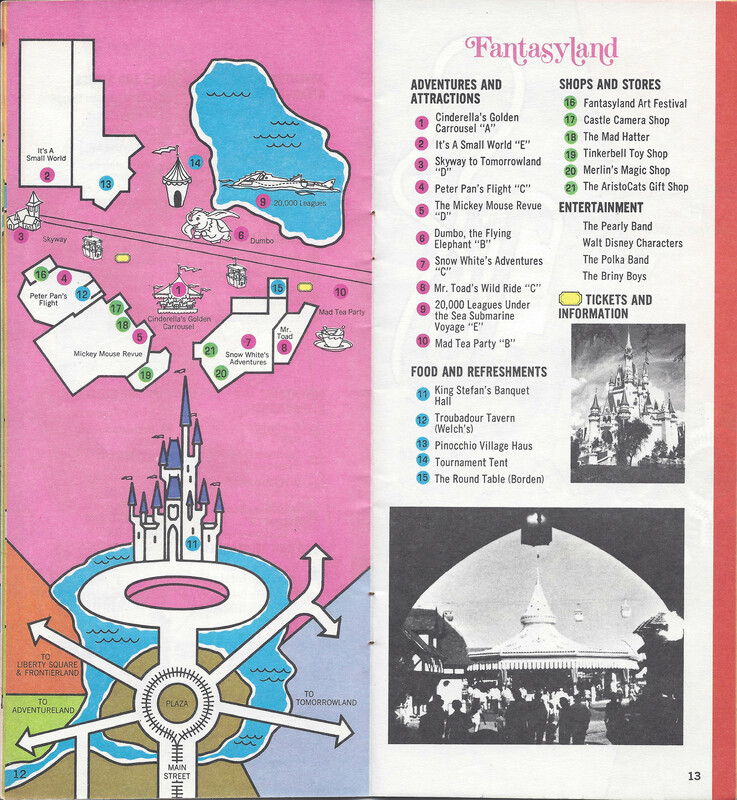 There is one surprising thing, though: the Coca-Cola sponsorship of Tomorrowland Terrace, in contrast to Pepsi sponsoring Pecos Bill Cafe and The Mile Long Bar, both in Frontierland. GAF has a little advice to make those pictures turn out better. 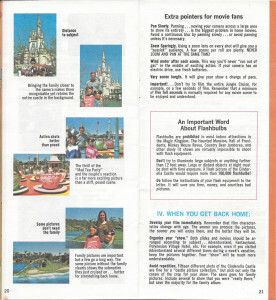 Let’s follow along with our sample Disney family vacation to make sure we get it all right. First of all, make sure you don’t move the camera while taking your picture. You absolutely don’t want to miss a single detail of your kids’ handmade macrame ponchos, now do you? Next, keep things in focus or else Minnie might appear to have conjoined baby mice instead of a nice group photo. 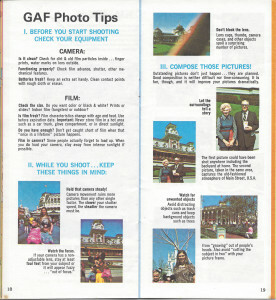 Lastly, don’t block the lens when you’re taking a picture of the Crystal Palace…actually, it seems like the the entrance to Adventureland is always under construction over that way, so maybe it’s not so bad. Next Mom takes a turn with the camera to show how it’s done. Dad gets a little forgiveness and is brought out of obscurity in the bottom left of the first picture. And while Mom really wants to show off the newest set of ponchos, that pose is really too stiff. For our last bit of advice, remember that your family vacation photos are much better without the family actually in them. 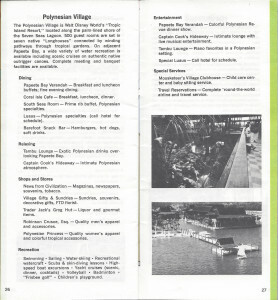 The rest of the guide gives a detailed account of all the locations mentioned previously. 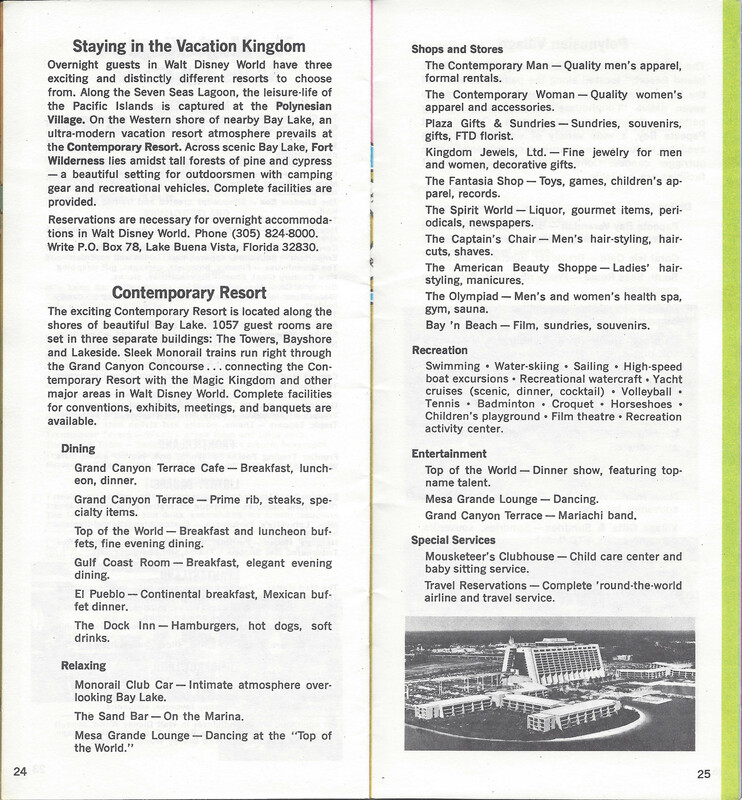 There is also a lot of information about the Contemporary Resort, the Polynesian Village, and Fort Wilderness. This entry was posted by Todd West. Bookmark the permalink.